The Office of Communications is responsible for providing strategic communications support for the UCLA Luskin School of Public Affairs. Working with both internal and external audiences, our staff tells the exciting and important story of UCLA Luskin to the general public and our campus community. By working with local, regional, national and international print and electronic news media, the office strives to generate media coverage of UCLA Luskin and of the people, programs, events and activities that distinguish the School. 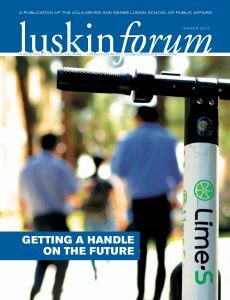 In addition to its public information and media relations functions, our staff maintains the School’s social media channels, manages the UCLA Luskin website, creates digital and print marketing materials, and produces the biannual Luskin Forum magazine. If you’re looking for an expert to comment on issues involving Public Policy, Social Welfare or Urban Planning, please contact our office. The UCLA Luskin School of Public Affairs has faculty experts in a wide array of topics. To request an interview with any faculty member, please contact us. The UCLA Luskin Communications Office offers personalized counseling for all faculty who are seeking media attention for their research. Assistance is also available for anyone contacted by the media for comment in their areas of expertise. Personal counseling about communications and media outreach will be provided by the Communications Staff, and they will assist with preparation of materials to be sent to media outlets, often in cooperation with staff at one of our research centers. Some news outlets plan their article and op-ed schedules weeks in advance. Therefore, it may be important to anticipate their needs and reach out well before publication. Think about how best to tailor coverage of the research to a national audience. Does the message need to be different for Californians? Angelenos? Your assistance will help build a media contact list and ensure that the right message reaches each audience. In almost every instance, in-house coverage on the UCLA Luskin website will be part of the mix. Additional coverage is often placed on the website of the appropriate UCLA Luskin research center. In many cases, we partner with the UCLA-wide distribution network by working directly with UCLA Newsroom to get out the message. We make sure that every news release we publish is also posted by UCLA Newsroom, which expands the readership. In some cases, a traditional news release sent directly from UCLA Luskin is best. Direct pitches to selected reporters may be helpful in certain situations. Other forms of contact, including email pitches, may also be needed. Let use know if co-authors, internal or external research associates, or outside distribution partnerships are involved. If the work was grant-funded, be sure to mention it. Please be prepared to provide contact information for any specific person or organization that will need to be part of the communication plan. When contacted directly by a member of the press, regardless of media outlet, please let the Communications staff know before proceeding. Normally this will be just a courtesy contact, but in certain instances we may ask you to coordinate your interview, op-ed or participation in a media event with other UCLA Luskin efforts to maximize the potential reach of coverage. The Communications staff can also assist with logistical details, such as helping to arrange for studio time to conduct an on-air interview. Don’t hesitate to ask. Once a print story has been published or an electronic piece has aired, please notify Communications so that we can share the good news on our social media channels and include a summary blurb on the Luskin in the News page. 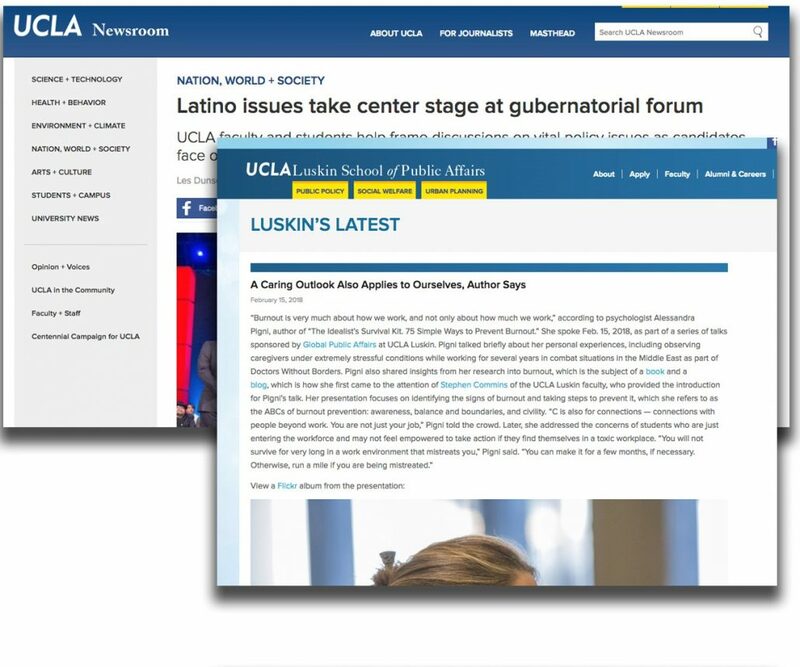 The UCLA Luskin Communications Office curates the Luskin’s Latest blog, which offers an opportunity for student organizations to tell others about their events. Guidelines about that platform are detailed here. The Communications staff will provide recommendations on how the UCLA Luskin website, our social media channels and, perhaps, the UCLA Newsroom site can best be used to tell people about what happened. In certain instances, limited support to get the word out in advance may also be provided. Generally speaking, the UCLA Luskin Communications staff looks to promote the School to external audiences such as potential students, UCLA alumni, local opinion leaders, and state or national policymakers. Topics of potential interest to news media outlets are also favored. Partnerships with community organizations or nonprofit agencies generally bring with them a built-in audience. Similarly, efforts by UCLA Luskin students have broader appeal if they directly benefit an underserved population or a local community in need. Professional news media are much more likely to pick up on our coverage if it shows students out in the field volunteering and interacting with people beyond the UCLA campus. The direct involvement of a UCLA Luskin professor may increase the potential newsworthiness of a student-led event, particularly if the event dovetails with the professor’s research efforts. Timeliness is a vital characteristic of a good news story. If you want to reach a broad audience, it’s best to focus on events that relate to a topic that has been in the news within the past couple of months. Stay abreast of local, statewide or nationwide issues, and time your events to occur when the societal or political controversy is still fresh in people’s minds. Who was there? What happened? What was the format and mood? Did the audience get involved or ask questions? Be sure to include a brief bio of your speaker(s), either within your summary or as a secondary “fact sheet” for reference. Also include the names, degrees and expected graduation years of all student organizers. Ideally, this will include a quote about the event from one of those organizers. Usually it works best if that quote focuses on the “why” of the story: Why did your organization get involved? Why is this a topic of importance? Why should readers care? Provide photos from the event that focus on relevant participants and locational significance. Use a high-quality camera, if possible. Cellphone images may suffice if they are well-lighted, in focus and framed to tell a story at a glance. Be wary of selfies and photos that will only make sense to participants. Action shots that show people doing something at an easily identifiable location are preferred. Get names and titles for anyone whose face is clearly visible in a photo. Ages and place of residence may be necessary too. Act quickly — summaries should be written within 24 hours, while the event is still fresh in your mind. And, for social media, consider supplying a quote or two while the event is still going on. Read the posted story or blog item. Let the Communications staff now ASAP if you spot errors. 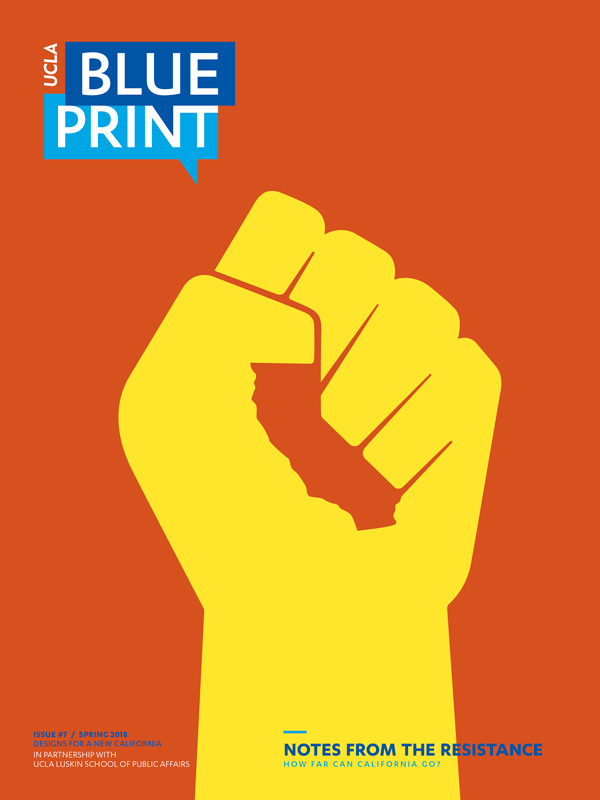 Produced in partnership with the UCLA Chancellor’s Office, Blueprint is journalism with purpose. It’s a magazine about ideas for improving Los Angeles and California — and about the people and institutions charged with doing that. It is meant to bring those together: to give civic leaders the best and most current thinking in public affairs research, and to expose academicians to the complexities and frailties of governance. Read online or download a copy in PDF format. Shown above are the official UCLA Luskin logos – in order of preferred usage. No other versions of the School logo should be created or used without authorization from the Communications Office. In order to effectively communicate the UCLA Luskin brand, it is vital that all faculty, staff, students, departments and units use only approved versions of School and Departmental logos. Do not attempt to alter or recreate logo files. If you need to resize a logo within your document, be sure to keep the image proportionally – it should not be stretched or squeezed in either dimension. The following links to the images shown above route to .PNG files and require UCLA credentials. They are appropriate for most desktop publishing, email and website use. If you need a different version of a file, if the image comes out grainy or if a file is not working for your purposes, please contact the Communications Office. Official stationery and business cards are available through a contract with Castle Press Printing. Click here for a Flickr gallery of faculty/staff headshots. Click here for additional information about UCLA identity and branding guidelines. Reference materials: For guidance on how to write about academic degrees, names of UCLA entities and other usage questions, download the UCLA Luskin in-house style guide (PDF). The Chicago Manual of Style is the preferred style guide for formal publications, letters, invitations, programs, etc. The AP Stylebook is preferred for media releases, business documents and contemporary language usage.